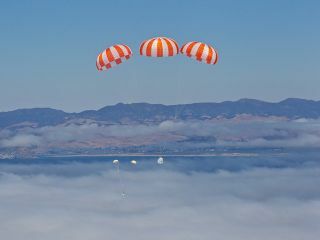 The three main parachutes are seen on SpaceX's Dragon spacecraft as it descends to the Pacific Ocean during an Aug. 12, 2010 drop test from an altitude of 14,000 feet. WASHINGTON? Space Exploration Technologies(SpaceX) has postponed a planned Nov. 20 launch of its Falcon 9 rocketandDragon space capsule to no earlier than Dec. 7, according to a companynewsrelease. "SpaceXis targeting December 7th forthe first-ever fight of our Dragonspacecraft,with the 8th and9th as backup dates," Kirstin Brost, a spokeswoman for the Hawthorne,Calif.-basedcompany, said in a Nov. 8 e-mail. "We are submitting our request to the[U.S.] Air Force today." Theflight, a demonstration of themedium-class rocket and Dragon cargo ship being developed under NASA?sCommercial Orbital Transportation Services (COTS) program, wasoriginallyslated to occur in September 2008. SpaceX?s COTS agreement was latermodifiedto reflect a June 2009 initial demonstration flight. Routineresupply runs to the InternationalSpace Station were expected to follow as early as December of thisyear, buthardware development has taken longer than planned. "Wehave assets tied to shuttle, but wealso think that additional testing on Dragon would be valuable," shesaidin a Nov. 8 e-mail to Space News. Meanwhile,SpaceX is still awaitingregulatoryapprovalfrom the U.S. Federal Aviation Administration(FAA) for the mission. The companysubmitted its license application more than a year ago, but the FAA isstillreviewing data on the Dragon capsule?s planned atmospheric re-entry. InJune SpaceX conducted a successfulfight testof Falcon 9with a qualification unit of the Dragon spacecraft on board. The nextthreeFalcon 9 missions will carry an operational Dragon cargo vessel in anincreasingly complex series of demonstrations under the terms of thecompany?s$278 million COTS deal. Thefirst such mission calls for Dragon tocomplete up to four Earth orbits, transmit telemetry data, receivecommands,maneuver, re-enter the atmosphere and make a safe water landing in thePacificOcean for recovery. Uponsuccessful completion of the demomissions, SpaceX will begin making regular cargo-delivery runs to theinternational space station under a separate fixed-price contractvalued at$1.6 billion. Thisarticle was provided by SpaceNews,dedicated to covering allaspects of the space industry.